Psychological well being is a positive psychological functioning. Six key dimensions are seif acceptance, positive relationships, autonomy, environmental mastery, puspose in life, and personal growth. Racial prejudice is a negative attitude directed toward people from certain race. 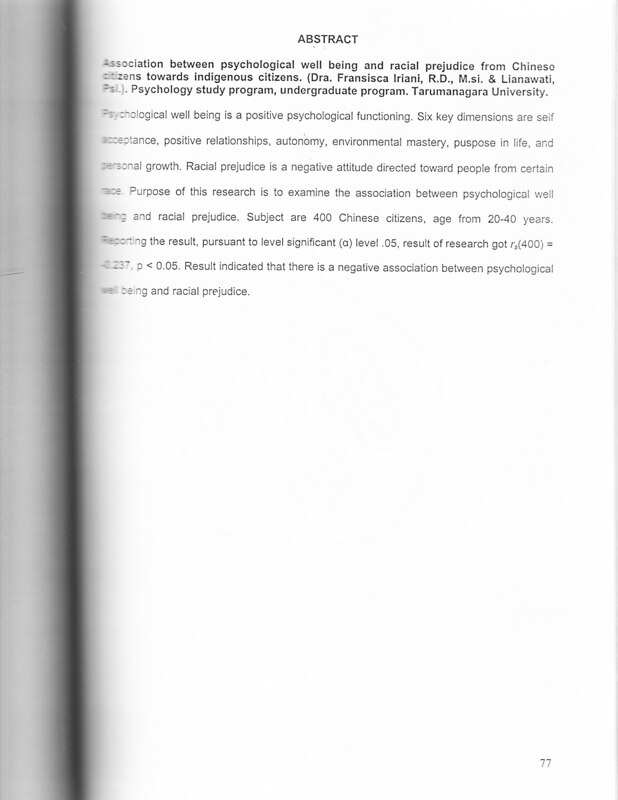 Purpose of this research is to examine the association between psychological well being and racial prejudice. Subject are 400 Chinese citizens, age from 20-40 years. Reporting the result , pursuant to level significant (a) level .05, result of research got rs(400) = -0,237, p < 0.05. Result indicated that there is a negative association between psychological well being and racial prejudice.